I keep telling myself that I’m going to cut back on travel, that I need to cut back, both because of the expense involved and the time away from writing. And yet… somehow, I find myself looking at four, yes, four, conventions in November. Each of them made perfect sense at the time that I signed up, but in every case I did so without giving much thought to what else I had going on other weekends. 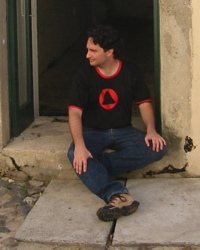 Conventions are a good segue to introducing this week’s EATING AUTHORS guest because it’s the only place I can reasonably expect to encounter my friend Christopher Kastensmidt, for the very simple reason that he makes his home in Porto Alegre, Brazil. Although he’s probably most well known for his work in gaming (everything from a technical consultant for LucasArts to the creative director for Southlogic Studios and later the Brazilian offices of Ubisoft), Chris’s fiction has also brought him some serious recognition. He’s been a finalist for the Argos Prize as well as the AGES Award. He also received a Nebula Award nomination for his 2010 novelette “The Fortuitous Encounter of Gerard van Oost and Oludara,” the first in a series of stories involving a Dutch explorer and a Yoruban warrior traveling the wilderness of sixteenth century Brazil. 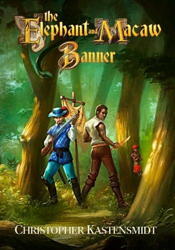 At long last these tales have been compiled into a single novel, The Elephant and Macaw Banner, which comes out from Guardbridge Books in one week. LMS: Welcome, Christopher. I’ve waited a long time to ask you, what’s your most memorable meal? CK: Brazil isn’t known as a culinary paradise. The meat is excellent (thus, the proliferation of Brazilian churracurias around the world), but beyond that, there aren’t a lot of well-known dishes. I ate my most memorable moqueca in an unlikely place: the 400 year-old São Marcelo Fort in Salvador. My wife Fernanda and I visited Salvador way back in 2007, in a trip which combined relaxation and research for my Elephant and Macaw Banner books. We spent about half our time enjoying beaches and restaurants and the other half visiting museums and historical sites. One of those sites happened to be São Marcelo Fort, a rarity for its offshore construction. We took a boat out to the fort and were surprised to discover a restaurant inside. Although I admittedly had low culinary expectations for a restaurant located inside a fort, the food looked tasty and we decided to give it a try. We weren’t disappointed, as the moqueca was legendary! If you ever visit Salvador, don’t miss the historical downtown, the beaches, the street-sold acarajé, lobster on Itaparica Island, and the moqueca at São Marcelo Fort! Thanks, Christopher. Despite the counter examples for November, I really am cutting back on travel and don’t see myself ever getting to Brazil. That said, on your next trip back to the states, please pack some moqueca (or at least some pirão). For my wife, of course. This entry was posted on Monday, October 29th, 2018 at 7:30 am	and is filed under Plugs. You can follow any comments to this entry through the RSS 2.0 feed. You can leave a response, or trackback from your own site.